Holy smokes. There is a lot to see in Rome, a city that’s hot, crowded, expensive, and wonderful. I flew to Rome on my way from Munich to Santorini because it was the cheapest route to get to Greece. Lucky me, because I have never been to Rome! Right away I fell in love with the Italians. I had the most incredible bus driver of the entire trip on the way to my couchsurfing spot. First I took the shuttle bus from the airport into town, then transferred from the shuttle to a local bus (funny, now that I am back in Seattle working – i.e. not broke – I would be taking a taxi so quick! I waited forever for that bus and was never fully sure I was in the right spot, but the price was right so there I was). Finally the bus did come, whew! I hopped on with my huge backpack and asked the driver in English (he only spoke Italian) how to get where I was going. I had the map pulled up on my phone, he gestured for it so I hand my phone through the grate that separates driver from passenger so he could take a look. Mind you he is careening through the streets of Rome as he’s doing this, and speaking a stream of Italian to me the entire time. So off we go, him driving while looking at my phone, smiling and laughing at me like he just told the best joke that I can’t understand, and me standing there hoping we don’t crash but also loving this entire exchange. What do you know, he dropped me off right where I needed to be! I couchsurfed for my entire time here with Lorenzo, a incredibly accommodating, goofy guy who: 1) hosted an Italy vs Greece World Cup party, 2) whipped up puttanesca and caprese for dinner and 3) took me on moonlit moped rides around the city. Zooming through narrow streets and stopping as we pleased to see the now-uncrowded sites was definitely the highlight of my time in Rome. I could not wipe the smile off of my face! Couchsurfing seriously changed my travels for the better! Scootering the streets of Rome with Lorenzo! 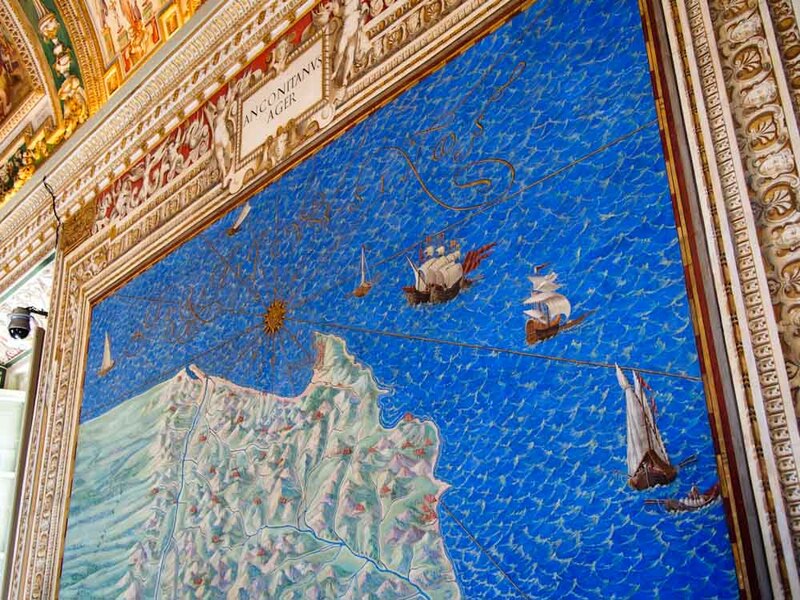 I loved these colorful maps on the walls of the Vatican! I can’t think of a city I have been in where I’ve been so aware of the history around me. Ruins are everywhere. I remember being frustrated with the metro system, since it never really got you close to where you wanted to be, and then a tour guide mentioned that the reason their metro is so bad is because every time they try and expand the routes they run into another old ruin and have to stop construction. I believe it! During my days I saw the Vatican (amazing), St. Peter’s Cathedral, the Colosseum, Spanish Steps, countless squares and fountains, and more I’m not remembering. All the photos from my trip are of architecture and art which doesn’t fully capture my time here, but I still love the look of them nonetheless. I think I was too hot and tired to take photos a lot of the time! But those tall cold birras certainly helped me recover every afternoon once my touring was done! Vatican guards standing watch. This guy did not move! I want to be on this patio!! !